A colored scanning electron micrograph (SEM) image of lung cancer cells. The magnification is x12,000 when the image is 10 cm wide. The cells that comprise the human body are constantly growing, dividing, and developing. Skin and hair cells divide and replenish daily, stomach cells completely replace themselves in two to nine days and the red blood cells in a person’s body are turned over once every four months. In order for this replication to occur, cells must have an abundance of the building blocks necessary for survival and growth. Errors in signals for cell proliferation — the process by which cells grow and divide to replenish lost cells — are responsible for serious medical conditions, most notably, cancer. Incorrect signaling can cause damaged cells that should die to instead grow and divide, leading to malignant tumors. 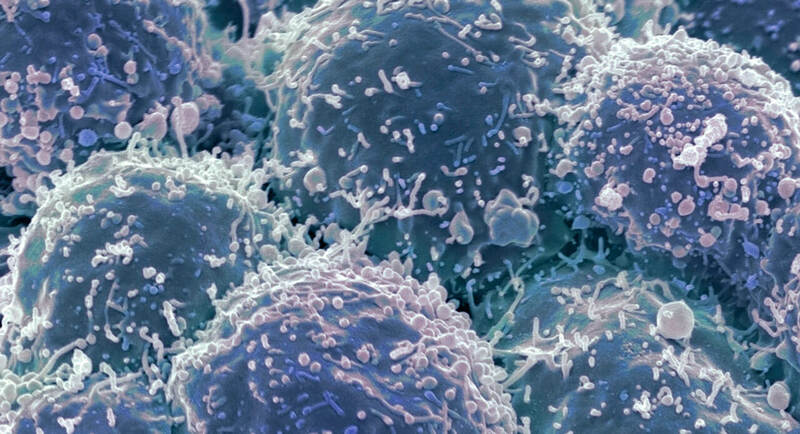 While normal cells only can grow and survive by adapting to fluctuations in nutrient availability within the cell and its surroundings, a breakdown of normal signaling can lead a cell to grow with reduced dependency to its environment which is the hallmark of uncontrolled growth of cancerous cells. Now, a group of researchers in Pfizer’s Oncology Research & Development group are shedding new light on one of the most important of those signaling pathways — the “mechanistic target of rapamycin complex 1”, or mTORC1. And the findings, published in Cell Reports, could have important implications for both cancer therapies and immune responses associated with organ transplants. The mTORC1 signaling pathway is the “master regulator of cell growth,” says Dr. Natasha Emmanuel, a post-doctoral research fellow in oncology at Pfizer’s Pearl River, N.Y., site, who conducted the research with Dr. Keziban Unsal-Kacmaz, Senior Principal Scientist in Oncology Target Discovery, and Dr. Robert Abraham, Group Leader of Oncology R&D at Pfizer. Dr. Keziban Unsal-Kacmaz, Senior Principal Scientist, and Dr. Natasha Emmanuel, a post-doctoral research fellow in oncology at Pfizer’s Pearl River, N.Y., site. But mTORC1 doesn’t act alone. A protein by the name of Rheb is the “key” required to unlock mTORC1 to start cell division. But Rheb itself has to be activated, and that happens with the help of two inputs, growth promoting signals and amino acids. In the right environment, the abundance of these two inputs flip the switch to activate mTORC1 in order to promote the production of building blocks so that cells can multiply. The research has found that the mTORC1 pathway requires an additional input for its optimal activity: purine nucleotides (building blocks of DNA and sources of cell energy). Using an inhibitor of purine production in cancer cells, they discovered that cell division (driven by mTORC1) could not be unlocked even if cells have enough growth factors and nutrients. The “key” Rheb specifically requires this additional input, purine nucleotides, to activate mTORC1. Unsal-Kacmaz says, “Emerging research in the past couple of years has shown that mTORC1 controls the synthesis of the purine nucleotides adenine and guanine. What we’ve demonstrated is that this regulation is bidirectional, so the availability of these nucleotides also affects the activity of the mTORC1 pathway through the “key” Rheb . The process by which signaling proteins in a cell send and receive information is similar to the children’s game “telephone.” In the game, one person begins with a sentence or phrase and whispers the phrase into the ear of the person next to them, and then that person repeats the message to the next person, and so on. The point of the game is to see how the message gets lost in translation from beginning to end. Cells receive signals from their environment. These signals cause proteins within the cell to become active, and this activation signals other proteins within the cell, which leads to further activation and ultimately a diverse assortment of possible cellular responses, such as division or differentiation, from one signal. But when those cellular communications go awry, like a game of “telephone,” it can cause problems with those responses. Understanding the mechanisms behind these processes allows researchers to further understand diseases like cancer, a hallmark of which is uncontrolled cell proliferation, and adapt strategies to defeat them. “It was pretty serendipitous the way this research came about,” Emmanuel says. In the process of studying a compound developed by Pfizer in the early 2000s, the researchers were able to affect the concentration of the purine nucleotides, and thus the activity of mTORC1, Unsal-Kacmaz notes of the fortuitous way in which her team arrived at the basic research. The results of this study have potential real-world applications, too. Emmanuel is now looking at how different tumor types respond to these purine biosynthesis inhibitors. She’s also exploring the way that immune suppressor drugs are used in organ transplant, because those drugs also inhibit the purine biosynthesis pathway. “Now we’re trying to understand if those types of drugs are also showing this type of immunosuppressive effect because of the inhibition of the mTORC1 pathway,” Unsal-Kacmaz says of one of the real-world applications.